It has been twenty years since Siberian baritone Dmitri Hvorostovsky edged out Welch bass-baritone Bryn Terfel to win the Cardiff Prize, and sixteen years since he made his American opera debut at the Lyric Opera of Chicago, singing Germont in Verdi’s La traviata. 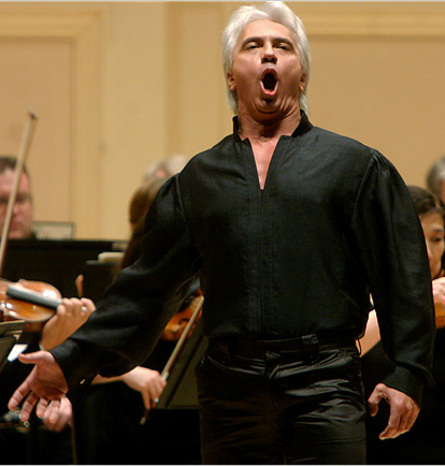 Germont remained the prematurely silver-haired singer’s signature early-career Verdi role, but being a true lyric baritone with a round sound, Hvorostovsky has always had a tenor’s focus but with a darker color. It was only a matter of time before Hvorostovsky’s voice would be burnished enough to take on Verdi’s lyric baritone roles, and Rigoletto has been at the top of Hvorostovsky’s “wish” list since before his career began. Hvorostovsky has been singing Rigoletto onstage now across a handful of productions in recent years. Saturday night, Hvorostovsky took the stage for a concert performance of Verdi’s opera with James Conlon and the Chicago Symphony Orchestra at the Ravinia Festival. Sporting a chest-revealing, open collared, long-sleeved black body shirt with sequined trim and matador-like tight trousers, Hvorostovsky walked onstage with swaying body motions that can only be described as swagger, and about as far from the traditional portrayal of the deformed hunchback court jester Rigoletto as imaginable. You had to feel for the Duke of Mantua: the poor guy never had a chance, despite getting all the girls and having the best-known aria in the opera. Rigoletto begins the opera as the malicious mouthpiece for the Duke, but even here, Hvorostovsky chose to bring a certain charm to his quips. But it is when he meets up with his daughter Gilda, held in secret so his many enemies in the court cannot take revenge on her for his sharp tongue, that the tenderness of the character is most in evidence, and these are Hvorostovsky’s stellar moments. Hvorostovsky’s vulnerability was also on display in the show-stopping moment of the evening, Cortigiani, vil razza dannata, when Rigoletto pleads with those who abducted his daughter to release her after his threats have failed. Cuban-American soprano Eglise Gutiérrez had some heft to her voice as Gilda in her initial duet with Hvorostovsky but the two voices blended beautifully. Her Gualtier Maldè! … Caro nome revealed a true coloratura with consistent beauty of sound across her wide range and a seamless passagio that was all the more impressive because of her ability to ornament her lines so exquisitely; her trills had such variety and could accelerate and slow down at will, fading off into nothingness yet never losing their full body. By contrast, every time Italian tenor Stefano Secco made the transition from his chest to his head voice as the Duke of Mantua, the disparity was distractingly noticeable. Yes, he hit the high B of La donna è mobile, but the audience seemed to clap as much in relief as in appreciation for his making it, so apparent was the straining ascent to reach it. His love duet with Gutiérrez did not make a satisfying vocal blend. The most trying moment of the evening was the opening of the opera when Secco was accompanied by men from the amateur Apollo Chorus of Chicago who have to sing unison lines that were loud and unfocused. Ravinia often tries to save money by using volunteer choruses rather than the stellar Chicago Symphony Chorus, and the result — particularly when the chorus is an integral part of the fabric of the music as is the case in Rigoletto — leaves much to be desired, particularly when set alongside the high standards of the Chicago Symphony Orchestra. James Conlon, a master Verdi conductor, kept the action moving and brought intense drama to the proceedings, appearing to bring out the best in everyone in the Chicago Symphony’s final concert of its 2009 Ravinia residency. Dmitri Hvorostovsky will give an all-Russian repertoire recital with pianist Ivari Ilja 8 p.m. Tuesday in Ravinia’s Martin Theatre that will include songs by Tchaikovsky, Rachmaninoff and Medtner. www.ravinia.org; 847-266-5100.